Drinking liquids right after your meal or during it, including tea, juice, alcohol or even water, can dilute the enzymes your body needs to digest proteins, carbohydrates, and fats. It can also cool down your stomach, reducing the efficiency of digestive process and letting fat get stored in the body. An ideal time to drink water is at least 15 minutes before you have your meal, and half an hour after you are done eating. Drinking water 15 minutes before meal times is actually beneficial since it fills you up and makes you eat less than you would usually eat. Drinking hot tea 30 minutes after the meal is also good as the heat helps break down fats even more. Mixing alcohol and caffeine is a big no. Drinking wine after dinner is a routine for many. But sometimes, after drinking wine with dinner, people might opt for a post meal cappuccino which is a bad idea. Caffeine in the coffee provides you with a boost of energy that can mask your intoxication. This can lead you to underestimate exactly how drunk you are. This can cause accidents like drunk driving. 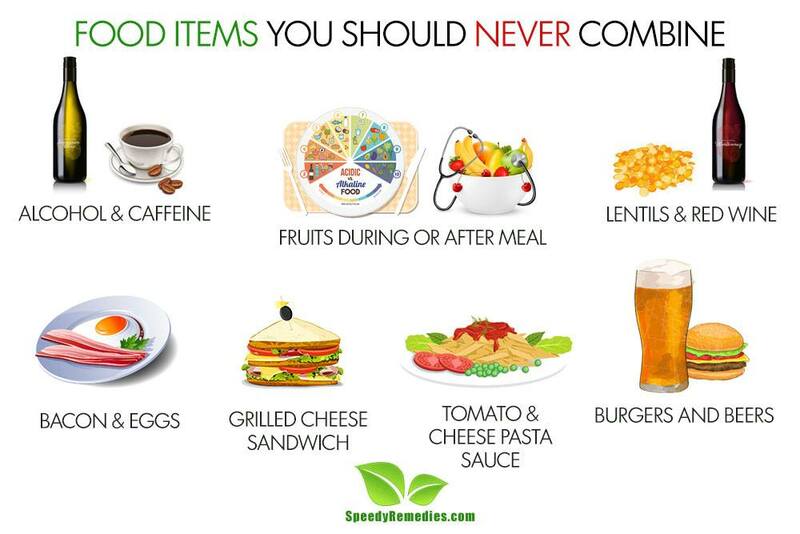 The same rule applies to directly mixing caffeine and booze or even caffeine and sports/energy drinks. You might love having some peppy mango salsa with fish or apple pie for your dessert but eating fruits during or right after the meal is bad for you. The reason is that fruits pass through the stomach quickly, digesting in the intestines. Meals, on the other hand, are complex and take relatively longer to digest. When you combine fruits with food like wheat or grain, fruits stay in your stomach for longer periods of time and start to ferment because they behave like sugar. Instead, fruits should be eaten 30 – 60 minutes before you have your meal. When fruit is eaten alone on an empty stomach before a meal, it prepares the digestive tract for what’s to come. Water rinses and hydrates the tract, fiber sweeps and cleanses it, and enzymes activate the chemical process of digestion. That’s why; eating fruit first makes the digestive tract more capable of absorbing nutrition. Red wines contain a compound called tannins. When this compound gets mixed with plant based sources of iron, such as lentils and soybeans, the body is unable to absorb iron properly. This is particularly problematic for vegans as plant based iron is anyway difficult to absorb. When you add tannins to the mix, you pretty much rule out any chances of providing your body iron. Eating together two protein rich food can exhaust your digestive system. Concentrated proteins are hard to break down, which exhausts the digestive system and depletes energy. The same goes for nuts and yogurt or fish and chicken. Instead of adding meat to your breakfast omelet, add veggies to it. Keep meat dishes for the last meal of the day. Your first meal should not be heavy, it should be light vegetables or protein based. The best time to eat meat is the last course of supper as digestive enzymes are at their peak. Don’t wait for more than 10 minutes between courses as the enzymes can start to shut off. Well, basically all protein – starch combinations should be avoided. This includes lasagna, turkey sandwich, meat and potatoes and chicken and pasta. Proteins and starch need different digestive enzymes and levels of acidity to be digested. When you eat them together, your body processes protein but not starch. The different digestive juices also nullify each other’s effectiveness leading to lots of flatulence, bloating and gas. Instead, you can mix protein or starch with non – starchy vegetables. If combining protein and starch is unavoidable, add leafy green vegetables to minimize the negative effect. You probably cannot imagine pasta without tomatoes, cheese sauce or meat. But this combination wrecks havoc on your system. Tomatoes are acidic and should not be mixed with starchy carbs such as pasta. Food combining theory does not recommend mixing carbohydrates with acid. Tomato has acids that weaken the enzymes in pasta and curdles the dairy in cheese. This combination is also very difficult for your body to digest; leading to post meal fatigue due to the amount of energy the body has to use to digest the food. Instead, have a pasta with pesto sauce and grilled vegetables to avoid exhausting your body after the meal. Yeah, they seem like a match made in heaven, but the combination is actually from health hell. Burgers and beers is not just extremely unhealthy, it is also kind of gross. Burgers contain fats while beer is alcoholic. Both of these substances are broken down by your liver. When you take them in together, your body prioritizes breaking down beer since it recognizes alcohol as a toxin. This leaves fat floating around in your blood steam (Eww! Gross!) where it can be stored in the fat tissue. It might also make you feel stuffed till your mouth as fat causes food to digest slowly. This is why, food with high fat content can make you feel bloated long after you’ve eaten it. This is basically fats combined with the wrong sort of food. It includes olives with bread or tuna with mayonnaise. The reason this is a bad combination is because fats require bile salts from the lives and gall bladder to break down. When you mix fats with other digestive chemicals, it can cause distress to the body. 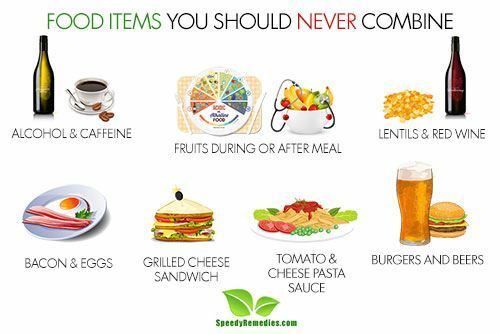 For example, eating foods with high fat content combined with foods with sufficient proteins can slow the digestive process. Instead, you can use small amounts of unrefined and organic fats like olive or coconut oil to cook vegetables, grains and proteins. Protein fats like avocados, seeds, and nuts should be combined only with non-starchy vegetables. It is also recommended to include a raw leafy green vegetable when eating fats. In short, your everyday breakfast is a terrible food combination. This staple breakfast food is bad for you since milk and cereal, both contain fast digesting carbohydrates. This can put your body under stress and cause your blood sugar to spike. When the blood sugar comes back to normal, you will feel tired and crave junk food. Drinking orange juice along with your cereal or oatmeal is also bad as orange juice contains acid that destroys the enzyme responsible for digesting starches present in the cereal or oatmeal. It can also curdle milk and turn it into heavy, mucus like substance. A healthier breakfast option would be to drink orange juice 30 minutes before you have your oatmeal.